Doris Pilkington wrote the book Follow the rabbit-proof fence upon which Phillip Noyce’s award-winning film Rabbit-proof fence was based. It tells the true story of Pilkington’s mother Molly Craig and two other Aboriginal girls forcibly removed from their families by the Government to be trained as servants and their extraordinary 1500-mile journey home on foot in 1931 following the rabbit-proof fence. Born in Balfour Downs Station in the East Pilbara in Western Australia, Pilkington and her mother were removed from their home by authorities and committed to the Moore River Native Settlement. At 18, Pilkington became the first person from a mission to qualify for a nursing aide-training program. She studied journalism and worked in film and video production. 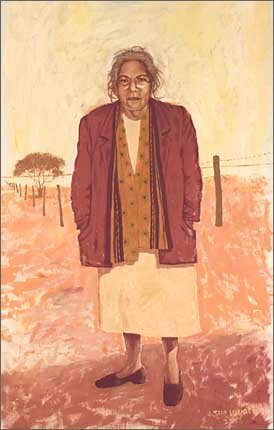 As an Aboriginal author, Pilkington works to promote and preserve the social history of the women of the East Pilbara region. Her other books include Caprice: a stockman’s daughter and Under the wintamarra tree . Susan Wyatt met Pilkington briefly at a function in Perth a while before the release of Noyce’s film. Pilkington wasn’t averse to sitting for a portrait but was very busy and it was February before she had time. Wyatt found herself with just three weeks to paint the portrait. On top of that she had just been appointed an ATSIC regional councillor and a member of the Aboriginal Housing Infrastructure Council so had to fit the painting in around meetings. She and her daughter drove to Pilkington’s home in the southern suburbs of Perth. They did two two-hour sittings on Pilkington’s back patio. Wyatt also took photographs of her subject. She has chosen to picture Pilkington against a desert background featuring three symbols: the fence, the lake and the tree under which Pilkington was born, which Wyatt got special permission to paint. Born in Kalgoorlie in 1951, Wyatt was educated in the Goldfields in WA. She studied graphic design at James Street Art School in Perth. She has done landscape designs for East Perth Redevelopment and the Moore River Native Settlement Memorial Site, Mogumber. She is also the illustrator of five children’s books.